The ABA’s Mobile Banking Terms and Conditions (“ABA’s MBTC”) applies to your use of the ABA Mobile Banking service. It is important that you read these Terms and Conditions before you decide to use this service. If you do not understand, or are unsure about any aspect of ABA’s MBTC, do not hesitate to reach out to us via web chat or call at (855) 23 225333. If you require a copy of the ABA Mobile Banking Terms and Conditions, please visit any nearest ABA branch, download from ABA website, or contact our Call Center Specialist at (855) 23 225 333. If you are using ABA Mobile Banking service, the terms and conditions will apply immediately and you are deemed to accept these terms and conditions before you can use the service. Unless otherwise specified, if there is an inconsistency between the ABA’s MBTC and Accounts’ terms and conditions, the Accounts’ terms and conditions shall prevail. In addition to the ABA’s MBTC, other terms and conditions, including those implied by law apply. In the event of any inconsistency between the English language and the other language of this document, the English version shall prevail to the extent of the inconsistency. The Bank reserves the right to change without any prior notice. We, at sole discretion, change terms and conditions from time to time without prior notice. As a reasonable care of its services, ABA shall give thirty-day notice before the change takes into effect through following means and you are deemed to accept the change. When you make a transaction with mobile devices you authorize us to act on the instructions entered into those mobile devices. All financial transactions involve a certain amount of risk. You should also be aware of other risks such as the possibility of unauthorized transactions on your Account. In addition, there is a risk that you may not be able to access your Account information or make transactions through a service, which is reliant on telecommunications systems. ABA is dependent on the reliability of its own operational processes and those of its technology and telecommunications partners in respect of devices networks, and telecommunications. Disruptions to these processes may result in Mobile Banking services being unavailable from time to time. While Mobile Banking allows you to transact simply using your phones or devices and codes, because of that simplicity, it also poses special risks. If someone else has your codes, they can transact on your Account as if they were you. You may be liable for such transactions. You should take special care to keep your codes secret and not disclose them to any third party including family, friends, and institutions. You should ignore any emails that appear to come from us that require you to input your codes. We will never send such email requests. These emails may come from third parties seeking to use the information to access your Accounts. You should also be careful about using services, which offer to interface with Mobile Banking or other means of electronic devices on your behalf. For example, you may be led to believe that you are inputting your card number, date of expiry card, phone number and password into Mobile Banking, while in fact you are disclosing your codes to a third party hosting a hoax website or scamming application. We continually look at ways to minimize any unauthorized transactions on your Account. We may use various techniques from time to time, including contacting you after an unusual transaction or series of transactions to confirm that you did in fact authorized the transaction(s). Your access to Mobile Banking may be suspended if we detect or suspect unusual activity which may be the result of malware or virus, ID takeover or phishing. ABA reserves the right to withhold access to Mobile Banking where we continue to detect malware or virus. “Mobile Banking Application” means ABA Mobile Banking. “you” , “your” and ”yours” means the person who has downloaded and used the Mobile Banking Application and any other person who uses that application. “we” , “us” and “our”means ABA Bank Ltd.“Designed Account” means the account for operation of Mobile Banking. “Funds Transfer Between Own Accounts” means the funds which is transferred between your own ABA accounts under your CIF number. “Funds Transfer across ABA Accounts” means the funds which are transferred though any ABA account. Law means any law, legislation, regulation, proclamation, ordinance, by law, rule, instrument, official directive, ruling, code of practice, code of conduct or prudential requirement in force in the jurisdiction where your Account is opened and held with ABA. Access to Mobile Banking is available on only personal accounts. You must also be over the age of 15 for Cambodian and 18 for foreigner. Details of which Accounts can be designed for Mobile Banking access are set out in your Account Terms and Conditions. If you are using ABA card, you can register for Mobile Banking by yourself without coming to the Bank. You can also apply for Mobile Banking service at any ABA branch if you wish. 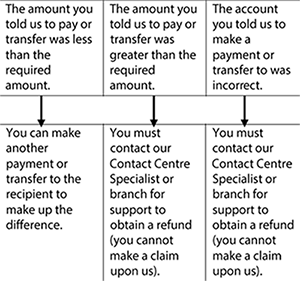 The daily transaction limits set by the Bank or requested by you (subject to approval from ABA). The Mobile Banking App can be used on a mobile device running an operating system supported by us, from which you can access the internet. However, not all of our full banking service can be accessed using the Mobile Banking. If you register at the Bank, your existing personal single accounts will be linked to your User ID automatically. Some accounts are restricted for fund transfer and bill payments based on account’s terms and conditions. (a) Funds Transfer Between Own Accounts are USD 20,000 per day. (b) Funds Transfer across ABA Accounts and bill payments are limited up to USD 20,000 per day. Unless you request in writing with ABA for an increased or decreased limit, all transactions conducted through Mobile Banking. Upon agreeing to the Terms & Conditions, you are hereby subject to any transfer limit imposed by ABA Bank and applicable the Law. While we make reasonable efforts to provide the Mobile Banking App services, we will not be liable for any failure to provide those services, in part or in full, due to abnormal and unforeseen circumstances beyond our control, the consequences of which would have been unavoidable despite all efforts to the contrary. This includes any phone network failures or, in the case of mobile networks, where you are not in an area of mobile coverage. The Mobile Banking App is provided “as is” with no representation, guarantee or agreement of any kind as to its functionality. We cannot guarantee that no viruses or other contaminating or destructive properties will be transmitted or that no damage will occur to your mobile device. We are not responsible for any loss you may incur as a result of this. unauthorized transactions if you or any other user have not made a reasonable attempt to disguise or prevent unauthorized access to a PIN or other codes. An unauthorized transaction is one, which is not authorized by a user, for example a transaction that is carried out by someone besides you or another user without your knowledge and consent. The Bank’s system determines your liability for losses resulting from unauthorized transactions. We will put our best effort on your claim to facilitate the recovery of funds on your behalf but we are not liable for any loss a result of your mistaken or erroneous transaction. There will be a specific fees and charges for fund recovery process and you, as the claimer, unconditionally agree to pay and indemnify, defend, and hold harmless to ABA and its respective shareholders, officers, directors, employees, agents, successors and assignors from and against any and all losses, liabilities, costs, expenses (including amount paid in settlement and reasonable attorney’s fees and expenses), claims, penalties, judgments and damages resulting from or arising out of handling the disputed funds. We will acknowledge the receipt of your claim and keep you updated of progress of your claim within 60 days after receiving official claims on written form and supporting documents. Once we have the information we require and are satisfied that you have made a mistaken payment or transfer, we will send a request to return of the claimed funds to the recipient’s financial institution and/or Payee’s Account Holder (if claimed fund is not yet withdrawn by the Account Holder). We will advise you in writing or phoning of the outcome of the request as soon as possible after receiving response from the receiving party(ies), as earliest as; not later than 60-calendar days. In case if the payee is the account holder of ABA, we reserves the right based on claim or disputed form from sender to put the disputed funds on hold for investigation and resolution. The holding period will take at least 45-calendar days or up to 60-calendar days, unless any exceptional circumstance, more time is required for further investigation, and you will be informed for the reasons of the delay. We will issue letter, based on information provided by the claimer, to ABA recipient for resolution through different communication means, including but not limited to direct presentment of letter in person by our staff, sending through postal address, or email address. You deem confirming the receipt of letter immediately if we serve the letter in person or when the postal service or mail server generates a confirmation of successful transmitting of message. The ABA recipient is strongly advised to respond by way of written communication within noticed period after receiving the Notice of Disputed Transaction letter from ABA. You are requested to present your argument and necessary proofs if you find the disputed fund is a true and correct payment. Otherwise, you have deemed accepting the dispute transaction(s) and irrevocably and unconditionally agreeing to authorize ABA in reversing the claimed funds if you don’t reply in writing to us by instruction in the Notice of Disputed Letter. The Bank will, at its sole discretion, would reverse the disputed amount from your Account and revert to the claimer while you unconditionally and irrevocably indemnify, defend, and hold harmless to ABA and its respective shareholders, officers, directors, employees, agents, successors and assignors from and against any and all losses, liabilities, costs, expenses (including amount paid in settlement and reasonable attorney’s fees and expenses), claims, penalties, judgments and damages resulting from or arising out of handling the disputed funds. Despite any right contained in these Terms and Conditions, in the event that you appear to be a Proscribed Person, then we may immediately refuse to process or complete any transaction or dealing of your; suspend the provision of a product or service to you; refuse to allow or to facilitate any of your assets held by us to be used or dealt with; refuse to make any asset available to you to any other proscribed person or entity; or terminate these arrangements with you. We will be under no liability to you if we do any or all of these things. If we exercise our rights under this clause, you must pay any losses, costs or expenses that we incur in relation to any action taken under this clause, including interest adjustments and/or administrative costs under these Terms and Conditions. follow all security measures provided to you by the manufacturer of your mobile device operating system that apply to your use of the Mobile Banking App or your mobile device (although you should never disclose your security details to them or information about your accounts with us). Undertake reasonable and adequate precautions to scan for computer viruses or other destructive properties. (b) You must not use the Mobile Banking App on any device or operating system that has been modified outside the mobile device or operating system vendor supported or warranted configurations. This includes devices that have been “jail-broken” or “rooted”. A jail broken or rooted device means one that has been freed from the limitations imposed on it by your mobile service provider and the phone manufacturer without their approval. c) After initial registration we will never contact you (or ask anyone to do so on our behalf) with a request to disclose your security details in full. If you receive any such request from anyone (even if they are using our name and logo and appear to be genuine) then it is likely to be fraudulent and you must not supply your security details to them in any circumstances. Additionally, you should report any such requests to us immediately. d) You will be responsible for all instructions given by you or anyone acting with your authority between when you log onto the Mobile Banking App until you log off the Mobile Banking App. e) You are responsible for making sure information shown or stored on your mobile phone is kept secure. f) You must advise us of any change to your mobile phone number without delay. What to do if there is a breach of security? If you know or suspect that someone else knows your security details, or has used or tried to use them, or if your mobile device is lost or stolen you must tell us without delay by calling Call Center Specialist on (855) 23 225 333, 24 hours a day, 7 days a week. We may ask you to co-operate with us and the police into the actual or suspected misuse of your security details, the Mobile Banking App or your account(s). Where our failure to comply is due to our obligations under any law. ABA Bank may terminate or suspend the app or functionality of the app or your specific use of the app at any time based on the Terms and Conditions stated above. We may terminate your access to Mobile Banking if all designated accounts have been closed. You can cancel Mobile Banking service by visiting any ABA branch, and fill the correct form. you, your agent or someone acting under your direction, is suspected of being involved in fraudulent activity in dealing with us. Beside reasons above, the Bank may, at its sole discretion, suspend your Mobile Banking if the Bank finds that user(s) are not complied with ABA’s relevant terms and conditions or regulations. We accept that sometimes we can get things wrong, and when this happens we’re determined to make them right again. If you believe that funds have been lost, there is any error in transactions, or you lose your mobile phone or device, you should contact Client Service Advisor or Relationship Manager who opened your account, or our Contact Center immediately by calling (855) 23 225333. The Bank will investigate the complaint within 60 days. Most problems can be resolved quickly and simply by talking with us. If the investigation is not completed within this time, you will be informed of the reasons. If it’s established that the error was from the Bank, the Bank will promptly correct the error and/or adjust any fee or charge that may have been as the result. If you are not satisfied with the result of Bank’s investigation, you may refer your complaint to the court. The Bank will assist by supporting any necessary document and information. any defect or deficiency in the provision of goods and services acquired; for example, purchase of mobile PIN through Mobile Banking. where you decide you no longer want the goods or services. You must be resolved with the retailer. We are also not responsible for complaints with respect to the goods and services a retailer supplies to the user if incorrect charging occurred. When you use ABA Mobile Banking App to make particular transactions, ABA may impose fees and charges. You agree to pay the fees and charges and agree that ABA may debit these fees and charges directly to your Funding Account or from the proceeds of the beneficiary Account (where applicable). These fees and charges may be amended by ABA from time to time. Full details of all current fees and charges are available at your nearest ABA branch or Fees and Charges Brochure on ABA website.